Down to our last week, still few to pick. We are normally closed on Mondays, but are open on Monday, Columbus day, October 8 from 9am to 5:30pm. These are usually available in either orange or white and weigh between 15 and 30 pounds. These are excellent for making pies and other baked goodies and are a good size for your miniature pumpkin pickers. They weigh between 2 and 5 pounds. There are various types and colors of gourds to choose from. Shapes range from mini-pumpkins to crown shapes. Did you know that the first pumpkin pie, if you can even call it that, was actually a whole pumpkin with the seeds removed? The cavity was then filled with honey, milk and spices and the whole thing was cooked in hot ashes! For more information about pumpkins and their history, click here! Cut pumpkin into 1/2-inch cubes. Heat stock, salt, pumpkin, onion, thyme, garlic, and peppercorns. Bring to a boil, reduce heat to low, and simmer for 30 minutes uncovered. Puree the soup in small batches (1 cup at a time) using a food processor or blender. Return to pan and bring to a boil again. Reduce heat to low and simmer for another 30 minutes, uncovered. Stir in heavy cream. Pour into soup bowls and garnish with fresh parsley. 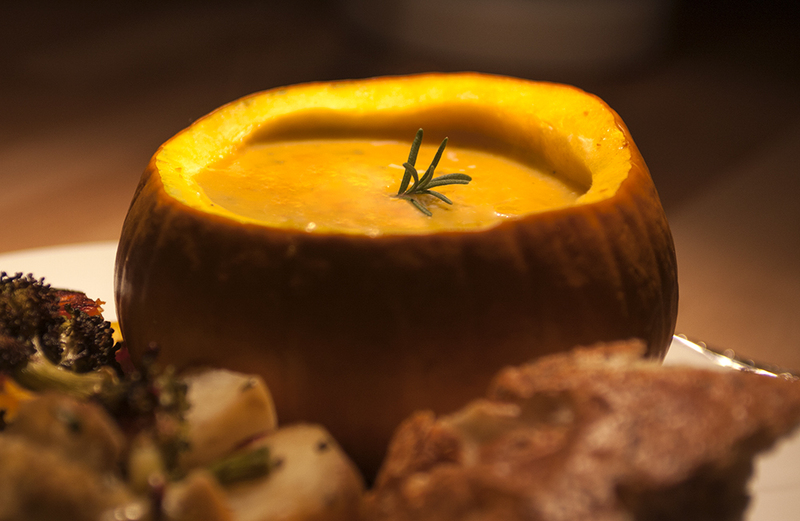 If you're feeling extra fancy, use small, hollowed-out pumpkins as serving bowls! For cooking purposes, choose smaller sizes, which will have a more tender, flavorful flesh. Select pumpkins that are free of blemishes, harvested with their stems intact, and those that feel heavy for their size. Store in a cool dry place, such as an attic or spare room (root cellars are too damp) at 45-60 degrees F up to a month, or refrigerate for up to three months. Higher temperatures cause the flesh to become stringy. For extended storage, wash skins in a solution of about a tablespoon of chlorine bleach to a gallon of water to disinfect the skin and discourage mold or rot. Dry immediately as dampness encourages spoilage. If you find mold, wipe with vegetable oil to remove the mold and seal the spot. Leftovers can be frozen or canned.